While federal workers may be breathing a sigh of relief that the government isn't headed for another shutdown, the latest budget deal between President Donald Trump and Democrats has left contract workers on the outs when it comes to recouping back pay -- particularly lower wage, hourly workers like custodians, security guards and food servers, who say they only get paid when the government is open. Congress has already approved and Trump has signed legislation that repays an estimated 800,000 federal employees impacted by the recent historic five-week shutdown. But like past legislation to provide back pay, that bill did not address contractors, whose checks come from private employers and not the U.S. Treasury. Yvette Hicks, a security guard at the Smithsonian's Hirshhorn Museum, said she was hoping that Democrats and her union could push through a solution at the last minute that put contract workers on par with federal employees. Hicks said she was able to pay her rent thanks to a GoFundMe account, but she still owes on other bills. The back pay would have caught her up completely, she said. "That's a very big disappointment after they fought for us to reopen the government," Hicks said Friday. "It's not sounding right to me. You can't fight harder?" 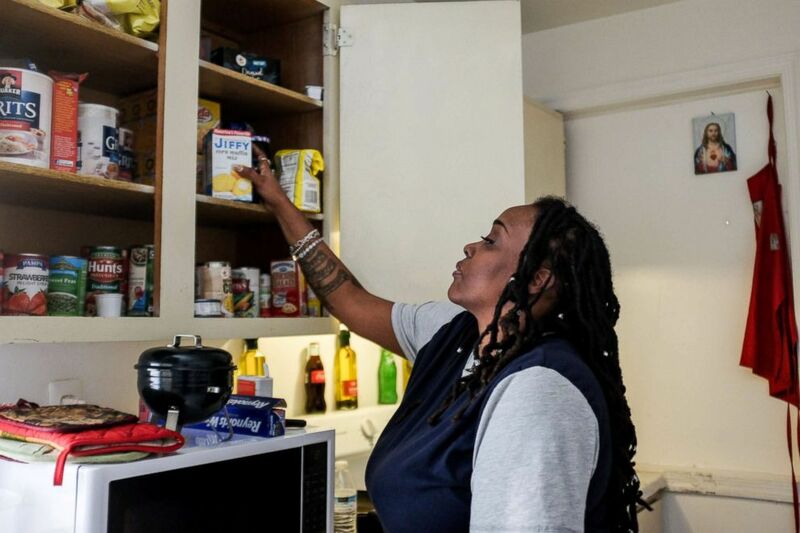 Yvette Hicks looks at free food that she has received from local food banks to feed her children during the shutdown at her apartment in Washington, Jan. 25, 2019. During negotiations for the latest budget deal, Democrats and two Republicans led by Sen. Tina Smith pushed for a provision that would have allowed for businesses to adjust existing contracts to repay any workers who lost wages during the 35-day shutdown. In the end though, the White House objected to the move as part of the budget deal, citing logistical and cost concerns. These are people who work as security guards and clean office buildings, and they work shoulder-to-shoulder with federal employees -- for all of us. "Even with detailed guidance, the risk of improper payment, overpayment, and fraud, waste and abuse is likely to be significant,” one administration official told ABC News this week. Smith (D-Minn.), who sponsored the legislation, disagreed. She and other supporters of the bill said the government already has a way to adjust the costs of existing contracts to account for new or unexpected charges. Smith at one point tweeted that the “argument that it’d be $$$ to implement is bogus,” although her office was unable to say how much the legislation would cost and how many workers might qualify. 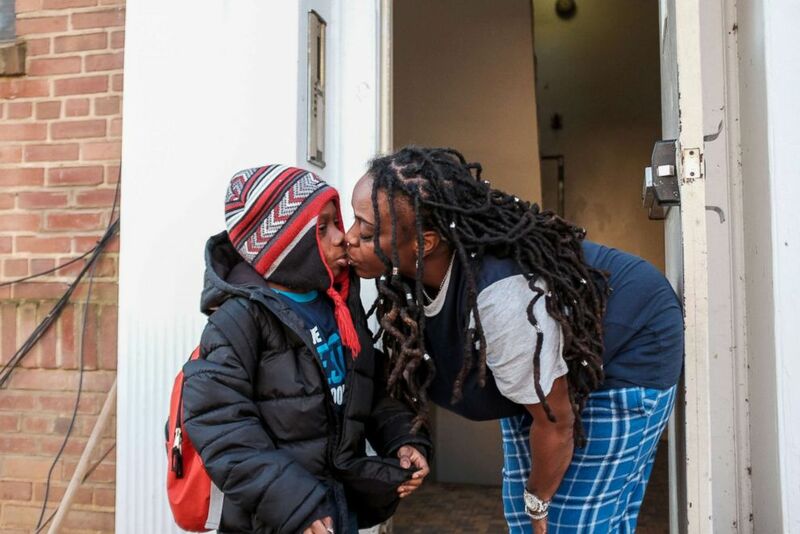 U.S. federal government contractor Yvette Hicks gives her son a kiss goodbye as he heads to school on the 35th day of the partial federal government shutdown in Washington, Jan. 25, 2019. "These are people who work as security guards and clean office buildings, and they work shoulder-to-shoulder with federal employees -- for all of us," she said. Democrats have said another option exists. The White House's Office of Management and Budget (OMB) could direct federal agencies to modify the terms of existing contracts to allow for back pay, they said in a recent letter to OMB. “Contract workers and their families should not suffer the consequences of a shutdown that they did not cause," wrote nearly three dozen Democrats in a letter to OMB. The federal government has said it does not know how many workers are employed through contracts or how many of those contract workers –- and subcontract workers -- were affected by the shutdown. In some cases, particularly among highly skilled workers, contractors may have still received paychecks if their employer was able to shift them to other projects or paid them anyway to avoid losing valuable personnel to competitors. Those most impacted by the loss of wages were considered people who are paid hourly.